Last week I went to New York City for the first time ever, to attend the Romance Writers of America conference. But this blog is about what happened to me in NYC before and after the conference. When my plane landed at LaGuardia, I ventured out to the Ground Transportation area. The young man who was facilitating bus transport was about my son’s age. I asked him, if it were his mom needing to travel to Manhattan, which option he would suggest. “If she has lots of money, I would say cab. If not…” and then, in his delightful accent, he went on to tell me about the bus. It sounded doable. I bought a ticket and waiting for the bus to arrive, started talking to a young man who was going to another airport to join his band members on a tour of Europe. At one point while we waited, I said I was stressed. He shrugged and said stress is a waste of life energy. Just talking to him relaxed me. He had more on the line than I, after all—trying to make a connection to get to Europe, for goodness sake. After boarding the bus, I started chatting with a young woman across the aisle. Of all things, she was originally from a town about 20 miles from where I live! The bus started to fill up, and a young man sat next to me. He had been all over the U.S., but was on his way home to India. We had a nice chat during the long ride, and he even offered me a bite of his sandwich. (Yum—chicken salad!) It smelled great, but although stress is a waste of life energy, my stomach was still a bit fluttery. Due to traffic, the bus ride was slow, which meant I had time to look at some of the city. The bus was also comfortably air-conditioned, and there was classical music playing softly over the speakers. Cabs wormed in and out of traffic, people busily walked along the sidewalks, horns honked constantly. The honking became just part of the background music for the four days I was in the city. 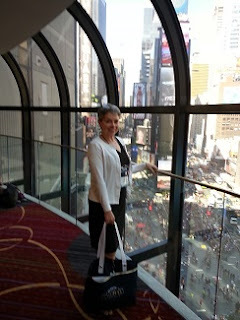 I had loads of fun with roomies Ginny Baird and Raine English, took furious notes in some of the workshops, met new people, reconnected with others, and ate lots of delicious food at restaurants in the Theater District/Times Square area. Ginny wrote a fabulous post here about the annual conference. Please read it if you haven’t already. When the conference was over, Raine and I shared a cab from the hotel, but she got out at Penn Station to catch a train home. Then I was a single traveler again. The young cabbie was pleasant when I asked questions, pointed out a few interesting sights we passed, and as we drove along the freeway, gestured toward the residential area where he lives. It was a quick trip because of the light Sunday morning traffic, and I cheerfully gave him a big tip when he delivered me to the airport. It seems a different person was in NYC. Now I’m just little ol’ me again, writing this blog while Attila is draped across my leg. But each experience changes us, and coming out of my shell a little bit certainly made the trip more enjoyable. Do you chat with strangers when you travel, or keep to yourself? I’d be interested in your stories. Wonderful! Makes me wish I'd been able to go. Good that you talked to people. I have trouble doing that but how much more richer it made your trip. I'm sure Attila was glad to have you back home again! We would have loved to have you there, Grace! Maybe next year in San Diego? I'm an introvert, but for some reason--maybe nerves--I just kept chatting to people. I seem to chat more with people in elevators than in taxis or buses or planes. Nicely done of you, Magdalena! I loved your bus trip. How fun to talk to all those people. I do talk to strangers when I travel. We chatted with the folks on our shuttle to the airport, but oddly enough my seatmates on the plane ride home were members of my local RWA chapter. We did not plan this. That's so cool about your RWA chapter friends as airline seat mates, Merrillee! I didn't realize you had worked in NYC, Karen. (Or else I forgot.) I'm sure I'm lucky it turned out as it did, but your comment about losing each other is *very* touching! It was, and we wish you could have been there too, Christine!